Honeywell UOP recently announced that United Airlines will use the company’s green jet fuel produced by AltAir to power flights from Los Angeles to San Francisco as part of its efforts to reduce carbon emissions and support energy diversification. Less than one year after construction began, the University of Maine at Farmington’s $11 million biomass district heating project is complete. The plant is officially online and has been sending heat to 95 percent of the campus for about a month. On March 16, Rentech Inc. released its financial and operating results for the fourth quarter and full year ended Dec. 31, reporting the company’s fiber businesses Fulghum Fibers and New England Wood Pellets generated record EBITDA in 2015. BioAmber Inc. has released financial results, reporting that the company’s fourth quarter performance exceeded its expectations, with $1.1 million in sales of bio-succinic acid during the three-month period. On March 11, Oregon Gov. Kate Brown signed legislation that doubles the state’s renewable portfolio standard (RPS) while eliminating coal from Oregon’s energy sources. 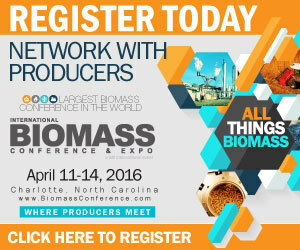 The measure also includes provisions related to biomass energy. United Airlines recently made history by becoming the first U.S. airline to begin use of commercial-scale volumes of sustainable aviation biofuel for regularly scheduled flights with the departure of United Flight 708 from Los Angeles. Five-thousand homes and businesses in Herten, Germany, will soon benefit from a clean, renewable energy source as Lockheed Martin and Concord Blue begin phase two of a new power generation facility that will transform waste into energy. Anellotech recently announced that it has received an additional $3 million equity investment from an unnamed and confidential multinational strategic investor and corporate partner, bringing total investment from this investor to $10 million. University of Florida Institute of Food and Agricultural Sciences researchers may have found a key to converting algae to fuel. The scientists have found what researchers call a “transcription factor,” called ROC40. BASF and Avantium have signed a letter of intent and entered into exclusive negotiations to establish a joint venture for the production and marketing of furandicarboxylic acid, as well as marketing of polyethylenefuranoate. With the growing need for high volume processing of organics for compost and anaerobic digestion (AD) conversion, WSM has introduced the WSM BioPrep Organics Processing System, a complete high-capacity system to convert waste into feedstock.